In a blog post earlier today, Pushbullet, the app that brings multi-device sharing to Android announced an update for Android 6.0 (Marshmallow). The update wasn’t a small one and featured the typical security and bug fixes as well as improvements to minor annoyances such as slow SMS sync, battery use, and for good measure the team even shrunk the app size by 25 percent. As far as feature releases, perhaps the star of the show are the individualized runtime permissions. Rather than approving blanket access for permissions when installing the app, you can now approve them as your app needs them. 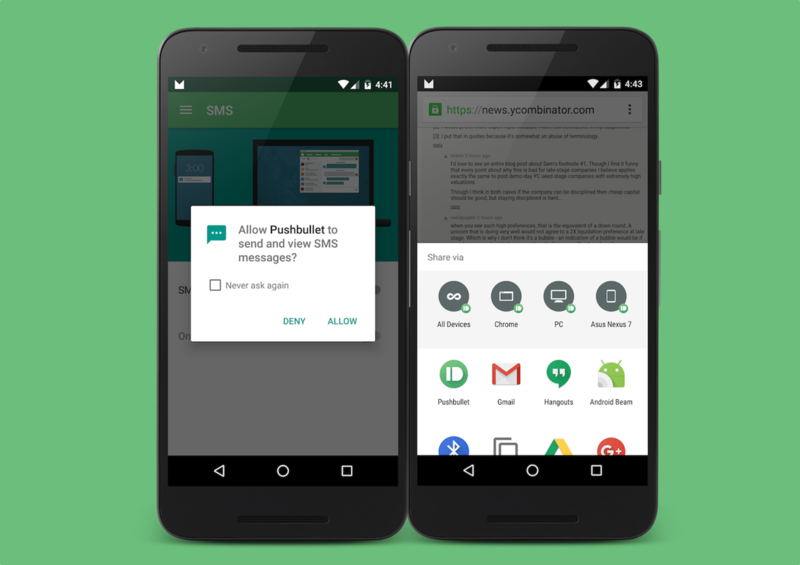 If you’re feeling extra tinfoil hat-y and you’d prefer Pushbullet not have access to SMS messages, now you can enable and revoke this access as you need it. Currently it’s set up to ask for permission for four specific groups: SMS, contacts, phone and storage. Additionally, I found the Direct Share feature to be useful. Now you can add all your connected devices to a single screen and the update actually takes into account your preferences for sharing when positioning them. So, if you share to your ChromeTV most often, it’ll appear first, then your laptop, then your tablet, etc. Now just cross your fingers that your device gets the Marshmallow update soon (if it hasn’t already).